Newest target indicator, communications and control equipment will be introduced in the submarine building design in accordance with requirements, Navy Chief Viktor Chirkov said. The Russian Navy gave the defenсe industry an assignment to develop 5th-generation submarines, Navy Chief Viktor Chirkov said on Thursday. "We have formulated the task for the defenсe and industrial sector to develop fifth-generation submarines. This work is ongoing. There will be no pauses in the development and designing of new submarines," the Russian Navy commander-in-chief said on occasion of Submariner Day Russia is celebrating on Thursday. The need for the development of such submarines is prompted by the "objective timeframe and the cyclical nature of the use of ships and submarines, and also the swift advance of ship-building technologies and scientific and technical progress in the field of submarine-building," the Navy chief said. 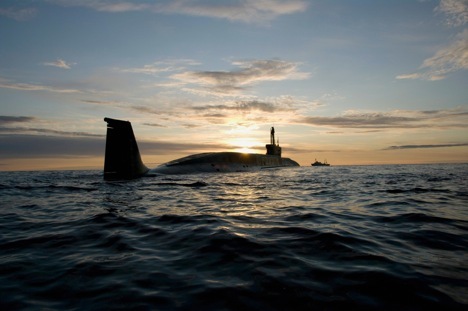 Russia should look far ahead in the development of its nuclear submarine fleet to avoid any stagnation, he said. "Designing strategic submarines the design bureaus and enterprises take into account our strict requirements aimed at making new generation submarines stealthier," said Chirkov. "Newest target indicator, communications and control equipment will be introduced in the submarine building design in accordance with our requirements. Submarines already now are equipped with new automated reconnaissance and alert equipment." The Navy commander says it is necessary "to look ahead and prepare the scientific base and develop engineering thought for principally new approaches in submarine building." "We are fully aware that non-nuclear submarines’ combat capability improvement will be made by integrating advanced robotic systems in their fighting equipment," Chirkov said. In the long-term prospect, he added, it is planned to create lead submarines and build new-generation submarines based on unified platforms, engage in serial building of unified-platform modular multipurpose ships of various displacement, creation of multifunctional robotic systems. Until 2020, Russia will work actively on building fourth-generation submarines, the Navy chief said. "This process is accompanied by the work to maintain the combat readiness of existing-project strategic nuclear submarines and their basic armaments," the Navy chief said.